El Metro designs its route to provide the most convenient way to go seven days a week to your destination. We serve more than 15,000 riders per day and about 1,300 bus stops throughout Laredo. So, next time your planning a trip or commuting to work Ride El Metro to your desired destination. 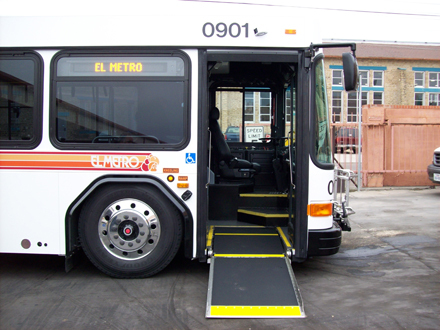 Ramps or lifts on all of our buses for riders using wheel chairs or scooters or ambulatory riders who have difficulty reaching the first step. Two priority seating areas for elderly and people with disabilities equipped with an easy-to-reach stop call bell and special securement belts designed to secure patrons who use a wheelchair or a scooter. Bus stop announcements, both audible and visual, at major stops, main intersections and transfer points along the route. Larger brighter destination signs on the front and side of the bus. Lighted “Stop Request” signs inside the bus for the riders with hearing impairments. Our Transit Center is located downtown 1301 Farragut.